Prostanthera sejuncta, Spiny Mintbush, is a scrambling; more or less prostrate ground cover that may reach a height of 50 centimetres. Many spreading branches have small, ovate, aromatic leaves that are pale to deep green above and paler beneath. Spines, up to 16 millimetres long are carried at the base of each of the opposite leaves. The spines are visible in the species image. This is an unusual feature and very few, if any, prostantheras have spines. The axillary flowers are 1.5 centimetres long, pale mauve to pale lilac. They appear from July to December and may be scattered or profuse. Sporadic flowering occurs at other times. Pruning will keep foliage thick and increase flower production. P. sejuncta would make an interesting ground cover in native garden beds. The Spiny Mintbush used to be part of the P. spinosa complex. In 1995 P. spinosa was split into three species. P. spinosa is restricted to Victoria and South Australia. 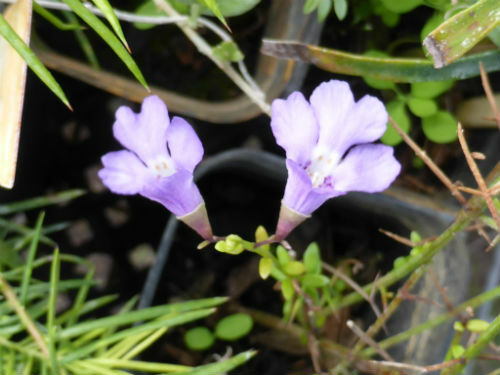 Plants from Mount Arapiles, Victoria are now known as P. arapilensis. P. sejuncta is the species name for the small populations found in and around Banyabba Nature Reserve and Fortis Creek National Park, near Grafton, northern NSW. The species name is from the Latin and means disjointed or separate. This refers to the separation from the other species. As with most Mint Bushes these three species propagate readily from cuttings.